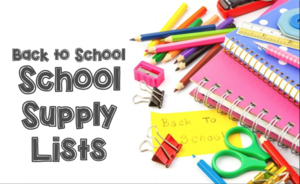 It's that time of year - SCHOOL SUPPLY SHOPPING TIME!!!!! If you want to send your kids back to school with the right stuff, start shopping now! The big box stores like Walmart and Target and online retailers such as Amazon currrently have some GREAT deals. Either way, everything on our list is broken down by grade for quick reference. Just remember to check with your child's teacher at the beginning of the school year for any special requests or restrictions.